Monk’s Café in Philadelphia is probably more well-known as one of the best bars for Belgian (and Belgian-style) beers in the United States. magazine. Some were from silent stills, while others were experiments (some of which were likely never intended to leave the laboratory as single malts… with good reason). However, even the evening’s worst whiskies had a lesson to teach. Some distillers have told me that they can tweak their stills to produce whiskies that clearly come from another region of Scotland, such as a peaty, smoky Islay-style malt in the middle of Speyside. While I don’t doubt that they can… A couple of the whiskies on this menu are clear reasons why they shouldn’t. Taste: Spicy and peppery with a taste of black tea leading to a lingering, spicy finish. A touch of water brought the floral notes back into the taste and smoothed the pepperiness out. Score: 86 points – This is different from “normal” Rosebanks… The cask strength gives it a real punch. Nose: Malty with heavy vanilla and barley notes, along with spices, especially cinnamon and nutmeg. Nose: Light and clean, with a touch of sea breeze and olives. Taste: Brisk and sharp, kicking the back of the throat, then settling down with oak notes showing through. Finish: Very smoky, slightly peaty, and long. Score: 93 points – Very simply, this is one of the best whiskies I’ve ever tasted! 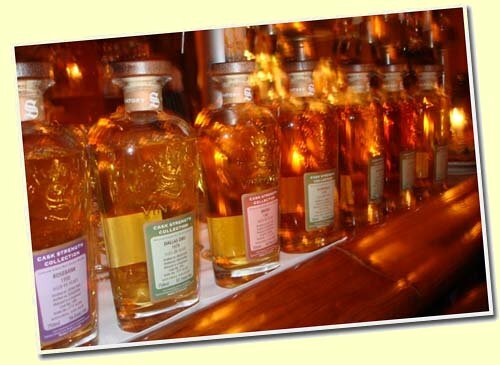 Nose: Simple, with strong notes of tobacco and leather and a hint of lavender and maltiness underneath. Taste: Woody and caramel-like (natural…no caramel coloring added). Finish: Not much…nothing stands out. Score: 77 points – This one spent too much time in the cask…and didn’t have much left to recommend it. Nose: Warm, spicy and sweet with a touch of figs. Taste: Very thin, but had hints of Heath Bar and butterscotch, along with honey and the requisite vanilla taste. Score: 80 points – An average score for an average whisky. Strathisla is one of my favorite single malts, but here the distillers decided to use peated water instead of their usual water source. They also aged it in a sherry cask, changing the character completely… and not for the better. Nose: Sherry, wood, and not much else. Glenkeith has never been a very strong single malt…much better for blending. In this case, the distillery tinkered with the formula to try and produce a smoky, peaty Islay-style malt in the middle of Speyside. Nose: Smoky, but nothing else shows through. Taste: More smoke…sherry, and unfortunately, the basic Glenkeith malt just didn’t hold up in this experiment. Score: 81 points – I suspect this particular cask was never meant to see the light of day as a single malt. It was an interesting experiment, and I’m glad to have had the chance to try it. I may have been a little hard on some of these whiskies, but Signatory deserves credit for giving us a chance to try them. None of them will ever be available again once these casks are gone, but they do provide us with important history lessons. Now, if I just had a time machine and could go back to smack some sense into the people who closed down Brora, Rosebank & Dallas Dhu.